Today’s guest post, written by Sean Hillyer, is about helping current and former military personnel wanting to remain in Schweinfurt after the military leaves next year. That’s how Schweinfurt Expats came about. By now, this group has also members without any military affiliation. Sean Hillyer hails from the Buckeye State and loves all things Ohio. He is a US Army veteran of Kosovo and Iraq, a student of Political Science, and a wannabe home-brewer. In addition to “Schweinfurt Expats,” “wtf, Cobra?” and his prodigious Twitter output, he is also a contributing author for Social Democrats, USA. 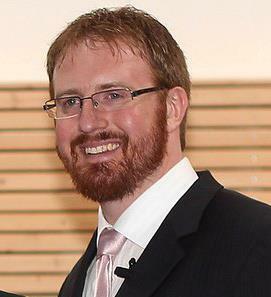 Sean currently lives in Schweinfurt, Germany. A couple of years ago I was the head of a veterans’ organization in Schweinfurt. It was a bit of a tumultuous time; the new guard was moving in—as we are wont to do—with fresh ideas and ways of doing things, and the old guard was standing pat—as they are wont to do—in defense of the status quo. This is nothing unusual in any multigenerational organization, but myself and Tim, my friend and lieutenant at the time, were getting fed up with it. A little over a year ago, years of speculation finally solidified into concrete fact. United States Army Garrison Schweinfurt, which had been home to thousands of American military and civilian personnel since the end of World War II, would cease to exist as of October 2014. It was something that we all saw as an inevitability, and yet it came as a shock to everyone. In the weeks that followed the announcement, the Army officials and community leadership did everything possible to demonstrate careful planning and consideration for community members. Soldiers and their families were briefed about the procedures for moving back the US or to another duty station in Germany. Briefings and seminars for were held for the installation’s German employees in order to prepare them for a return to the German workforce or for retirement. And American employees were afforded every opportunity to apply for transfers back to America or elsewhere in the world. This was, of course, all well and good. Until it became abundantly clear that one demographic was being excluded from this meticulous planning: Americans wishing to remain in Schweinfurt. So I started making enquiries of the community leadership. How many Americans want to stay here? What can the Army do to make our transition easier? What sort of events and briefings are going to be held to inform us of our rights and obligations as future residents of a foreign nation? And at every turn I was met with a disappointing answer. The Army didn’t know and had very little interest in finding out how many Americans were planning to stay. Nothing was being planned to ease our transition, nor would there be any information made available about how to go about continuing to live in Germany without the Army’s assistance. Now, that all sounds quite callous. I should make mention, however, of the fact that everyone with whom I spoke, from the Garrison Commander all the way down, expressed concern for the situation. It simply seemed as if very little could be done about it. No American military installation had ever, as far as we know, undertaken any special steps to assist its members in remaining in a foreign country. There was no existing plan or template off of which to work and lack of information about the size and needs of the demographic likely made it fiscally irresponsible to devote time and resources to creating such a plan. By this point it had become abundantly clear that if anyone was going to help out the future expatriates of Schweinfurt, it was going to be the expatriates themselves. Suddenly, the idea of Schweinfurt Expats as a real group and a force for good, instead of just a break from a bad situation, became not only feasible but necessary. So I took the idea and ran with it. After talking with Tim it seemed that the best way to get organized was through social media, so we started a group on Facebook where expats could get together and chat, ask questions of one another and share information. We ended up having more than one rule, but I think we are still only up to four. The Facebook group was a good start and after a couple of weeks we had a small but engaged group of people interacting with one another. But after a while it became clear that the group would not be effective in reaching all members of the community. It had, however, given me a good idea of what the core set of concerns was amongst expats. Armed with that knowledge I engaged another friend of mine, Greg. Greg had become similarly disenfranchised with the aforementioned veterans’ group, but continued to serve soldiers and veterans through his work with Schweinfurt’s Soldier and Family Assistance Center. Together we sat down and came up with a plan to hold a series of informational seminars where future expats could receive information and have their questions answered by subject matter experts from various German government agencies. We planned for multiple dates and guest speakers, using the wants and needs of the Facebook group as a guide. We planned it all out to the last detail and then… nothing. Unfortunately, the project went dormant for nearly a year. This happened partly because personal and professional matters got in the way. But it was mostly because neither of us had the connections necessary to contact the desired agencies, let alone convince them to give up valuable man hours to come and give a presentation, in English, to a group of undetermined size and interest-level. It’s hard enough to get people to bet on a sure thing; getting them to throw-in on a stretch is even harder. And so, we shelved it. That is until earlier this year. 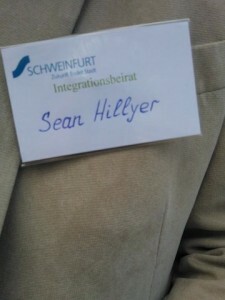 Around March I began volunteering with one of the working groups of the Schweinfurt Integration Council. I began to meet some great people who had a genuine interest in assisting foreigners living in Schweinfurt. This interest extended to the American community and it didn’t take much convincing to get some of them excited about the seminar concept that Greg and I had developed. I had the opportunity to get to know people who had friends and colleagues with the agencies we most desired, and they were all happy to help make arrangements. 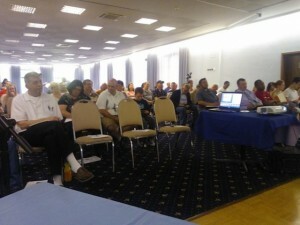 Finally, on June 6th, we hosted Settling in Germany: A Seminar for American Immigrants. Five presentations were given that evening by the Schweinfurt Immigration Office, the Employment Office, the Paritätischer Wohlfahrtsverband, the Volkshochschule and the ABBI Project. Those in attendance learned how to apply for a residency permit, how to find a job, where to go to learn the German language, and so much more. Although the event ran for over three hours, the audience was engaged, motivated and eager for more. Many remained after the event to ask questions of the presenters one-on-one. Since the success of the seminar, Schweinfurt Expats has only gained momentum. Bolstered by the increase in participation, we have hosted two meet-up events aimed at bringing everyone together and getting to know each other on a personal basis. Our Facebook group and email list has also grown considerably and both now include expats without military affiliation. We’ve also recently partnered with the Wirtschaftsjunioren Schweinfurt and the Handwerkskammer Unterfranken to host a job fair on Conn Barracks at the end of September. The German-American Job Fair, which aims to put expats in contact with potential German employers from a number of industries, is the first event of its kind and is a unique example of the strong ties between the American and German communities in Schweinfurt. I’ve had a lot of fun with Schweinfurt Expats so far and I can’t wait to see where we go from here. We’ll continue doing the meet-ups, of course. And hopefully we can pull off another large event or two before the Army pulls up stakes in 2014. What I’d really like to see is American expats getting involved in their communities on a large scale. I want for us to go out there and be active, be known and be useful. I am a firm believer that a community functions best when each member takes an active role. That’s what I would like to see Schweinfurt Expats do. I would like to see us, as a group, not just live in the Schweinfurt community, but be an active part of it. Hopefully we can get there some day.